Over 100 people were inspired at the September edition of PMI Monthly Meeting, hosted by Fortech and organized in collaboration with PMI Chapter Romania, Cluj Branch. It was a good start for debating in the PM community how innovation can help us in delivering better projects and managing effective teams. Traditionally, September is Fortech’s month for hosting a PMI Monthly Meeting. 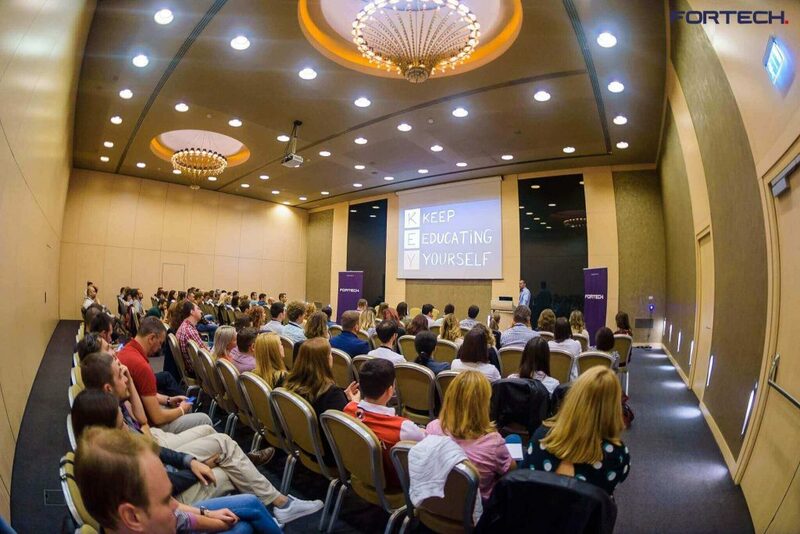 Over 100 professionals from Cluj PM Community interacted and debated about how they can bring innovation in their day-to-day work. The Golden Tulip’s conference hall was full house, but also rich with relevant ideas to counteract the fast rhythm of changes in IT and project management fields. Under Approaches to Innovate in Project Management theme, the agenda included a technical presentation, followed by a panel talk, where professionals from other two IT companies joined the conversation. Our colleague, Augustin held a presentation, where he exposed theories about innovation and ideas about the future of project management. He encouraged us to embrace change, one of the ways for letting in the innovation into our work and our organizational culture. Rethinking project management is possible if we anticipate the uncertainties and we adopt a collaborative and flexible delivery process with our contractors. Creating and promoting inside the team an environment where questions are more than welcome and new perspectives are appreciated, encourages innovation. It’s important to establish right from the start a strategy for innovation and involve all the stakeholders. For example, the maintenance team can play a major role in the first phase of the project implementation. Their solutions can improve performance and cut the future costs. When we are talking about organizations acting as one big organism, a solution is to control the risks of innovation that may affect the whole company, by conducting pilot projects limited to a certain period. Recent studies of the International Project Management Association (IPMA) reveal that the project seen as a business is one of the trends, where the emphasis is on value and benefits, while budget and time are not perceived as constraints. In this new context, the project managers need more autonomy, influence, and entrepreneurial capabilities. But also, they must be aligned with the company’s strategy, acting as leaders and business experts. The panel talk was an opportunity for the audience to understand the impact of innovation. The topics debated enclosed aspects on how you support the clients to embrace innovation, but also how you nurture innovation in a company where the orientation towards the process is the norm. Inspiring subjects and great conversations like this, motivate us to keep contributing to a growing community such as PMI. We are looking forward to the next meetings and the opportunities to exchange ideas with professionals, gazing together into the future of project management.